That was quite an errand, for a boy to go alone over the country, and find his way, for fifty miles, and then walk home again. But Joseph was a boy who could take care of him-self, and could be trusted; so he went forth on his journey, walking northward over the mountains, past Bethlehem, and Jerusalem, and Bethel -- though we are not sure those cities were then built, except Jerusalem, which was already a strong city. Joseph said, "I am looking for my brothers, the sons of Jacob. Can you tell me where I will find them?" And the man said, "They are at Dothan; or I heard them say that they were going there. 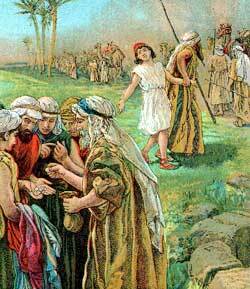 Then Joseph walked over the hills to Dothan, which was fifteen miles further. And his brothers saw him afar off coming toward them. They Walking knew him by his bright garment; and one said to another: "Look, that dreamer is coming! Come, let us kill him, and throw his body into a pit, and tell his father that some wild beast has eaten him; and then we will see what becomes of his dreams. And Jacob's heart was broken over the loss of Joseph all the more because he had sent Joseph alone on the journey through the wilderness. They tried to comfort him, but he would not be comforted. He said: "I will go down to the grave mourning for my poor lost son."